The StudioPRO Collapsible Travel Softbox for LED Light Panels (JL650) is a valuable essential for your 650 LED setup. The soft diffusion adds greater control and options to your light set up. Simply use the attached elastic velcro straps to fasten the softbox to your Daylight or Bi Color LED panel for instantly softer continuous light. The silver interior of the softbox brightens your LED's light while the white diffuser panel spreads light evenly on your subject, perfect for any kind of photography or videography shoot. The softbox requires no set up time, staying structured with its collapsible magnet support rods for quick assembly. The softbox folds back into its small, included travel-sized carrying case for taking on-the-go with your lights. 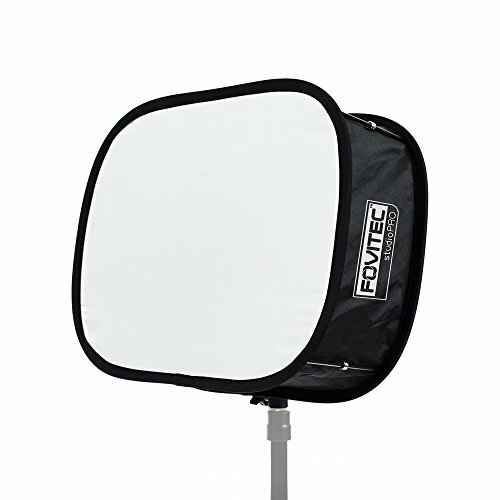 Use the softbox with your 650 LED for photo or video shoots that require soft, diffused light on your subject's face.